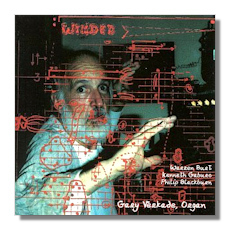 Performed on the Casavant organ at Clapp Recital Hall, University of Iowa, Iowa City in 1995 (Burt, Blackburn); and on the Rieger organ of the Neanderkirche in Düsseldorf, Germany, on June 9, 1993 (Gaburo). In this recording the keyboard takes a back seat to electronic sounds and taped speech, creating an intimate atmosphere that sometimes feels as though we are eavesdropping on a private conversation. It is a far cry from the very public spectacle of the organ leading choirs in song. The works here are, for the most part, quiet and personal, not at all what you would expect from the mighty King of Instruments. After the excesses of the late 18th and early 19th centuries, when composers exploited the organ's ability to create masses of sound, it's not a bad direction for the instrument. Of the three composers represented, only Gaburo is well known. He is an American, born in New Jersey, studied at the Eastman School and the University of Illinois, and taught at the University of California at San Diego. Phonetics and linguistics are fundamental concepts in his later works, which also use mathematics and the aleatoric methods of John Cage. "Antiphony X" is the last of a series of works written between 1957 and 1991, all for tape and live instruments. In this case, the tape came first and the organ score was derived from it by means of spectral analyses of the taped sounds. The result is meant to convey a very wide range of feelings, from playfulness to dread, in the composer's own description. Gaburo's use of numerical, analytic, and random methods to assemble this piece gives it a highly arbitrary surface texture. It may be difficult for someone unfamiliar with this style and technique to hear anything beyond atonal landscape with a great variety of colors and gestures. Conventional notions of melody, harmony, and rhythm are irrelevant here. Which is not to say that there is not a lot of imagination and life in this music.There is in fact a lot to enjoy, especially for someone who likes Ligeti or Stockhausen. Behind the whooshes and squeaks is a consistent sense of development and forward movement, and at times even urgency. The piece develops slowly and covers a wide timbral range. "Antiphony X" is bracketed by two pieces by younger composers who studied with Kenneth Gaburo, written at the request of the performer and in memory of their teacher. The first, Warren Burt's "Recitative," is very quiet and calm. It used Gaburo's voice as its starting point. Burt took a recording Gaburo made of his "Pentagony," a "linguistic composition," and processed it by computer to create the tape part for the new piece. The organ part, too, is based on this recording of Gaburo's voice. The second piece, Philip Blackburn's "P.P.S.," is even more personal,consisting primarily of a spoken communication from Gaburo to one of his teachers. The organ doesn't even appear until halfway through the piece and then contributes a little commentary. This piece consists of mostly vocal sounds, and the language is, happily, Italian, one of the most musical of tongues. Neither of these homages comes close to the level of the teacher's work,lacking the inner logic and deep structure of the "Antiphony." They are effective mainly as tributes to the master's style and memory, but would not stand well on their own. Taken together, the three pieces form a coherent unit and a valuable example of the avant-garde in composition for the organ.